The project sidebar is here to stay. We built this new navigation experience to make it easier for you find what you need in your projects, and gave you the option to preview what was coming back in February. Given the overwhelming positive feedback we've now fully implemented the sidebar. We've also reordered the sidebar menu items to make it easier to navigate. If you've used the sidebar with JIRA Agile before, you'll notice that boards that include multiple projects now have a project sidebar as well, albeit a simpler version. Renamed to "Basic software development"
JIRA Agile is now required for this project type. Some time ago we released a feature to JIRA Agile known as inline issue create, which gave users the ability to create issues on the fly without the need to click the Create button. We've iterated on this and added the ability to create issues inline to all projects. Simply click the Create link at the bottom of your issue link, add a summary and press enter to create your issue for that project. We've improved the way you can attach an image or file to an issue by allowing you to now drag and drop an image or file to any part of an issue screen. You can also use your regular paste options (using your keyboard or right-clicking) to paste a file or image from your clipboard to the issue. Due to this, we've removed the Attach screenshot menu item, and the Attach file menu item now opens a File browser dialog to allow you to browse to your file or image. 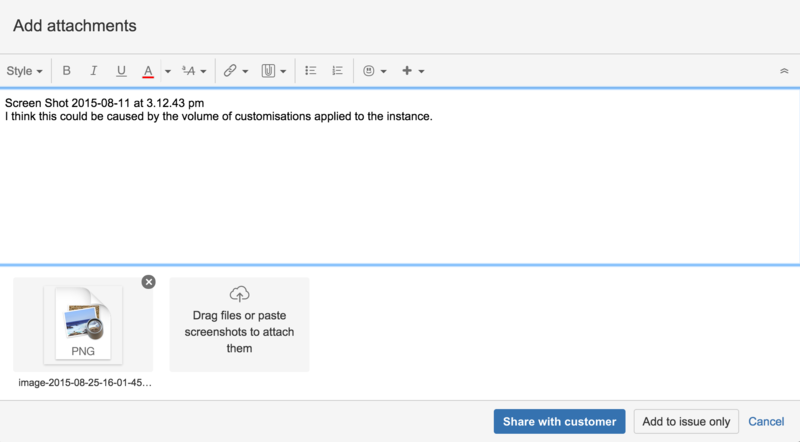 If you're using JIRA Service Desk, agents will also be able to add attachments directly to issues by dragging and dropping, or by pasting, and this will open an additional Add attachments dialog that gives you the ability to add a comment to the issue that relates to the image. We've been working on automated responses in Service Desk, and in this release we've tweaked the wording of the default set of notifications to make them a little friendlier. We've also decreased the number of default notifications sent to service desk customers, and updated the format in which notifications are sent. We've also added a little smarts to Service Desk to pre-populate the comment section of an issue when an agent responds to a customer. The pre-populated text can be removed or edited as required on the response. The screenshot shows the format of the response. Check out the full list of bug fixes and feature improvements in this release here.